Hi, I just discovered a stump full of beautiful red reishi mushrooms growing off my deck. 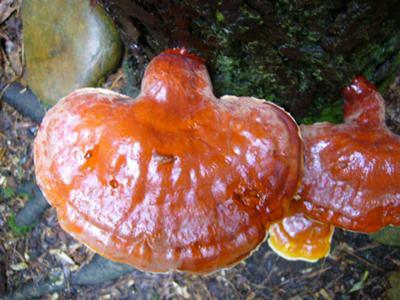 I've researched these wonderful mushrooms and they are indeed wild red reishi. My biggest question is when to harvest for the highest medicinal content. Secondly, should I use a dehydrator (my oven will not go below 170 which is too hot). There are at this time 14 in various stages of development with a maybe 3 being solid dark red and the largest. I really would appreciate information as to how to properly treat this amazing gift. Thanks in advance. If deck is of treated lumber, I'd be hesitant. After drying you cook some of the mushroom when you need by bringing water to a boil and them simmer on low for 2 hours- do not use a metal pot but glass or ceramic pot only. After cooked strain and drink a little over the next few days. It is an aphrodisiac so be careful and do not use regularly maybe a few days every few weeks only. Store in fridge and heat a little before drinking. Gorgeous picture! All you folks writing in recently about amazing mushrooms that you've found growing right on your property are making me very jealous! -Keep a close eye on their size, and pay attention to when they don't seem to be getting any larger and don't show any new growth around the edges. -When they darken to a deep reddish color. -When they release their spores. You can often determine this because the cap will become a red-brown color and appear to be covered with dust. This "dust" is a layer of mushroom spores, meaning your Reishi mushrooms have reached maturity and are ok to harvest. Of those indicators, I've read about people using the dusty brown spore layer the most. Watch for it! As for drying, I agree that 170 is probably too high. You can use a dehydrator (I have one that goes down to 95 F). However, you may have too many mushrooms to fit in it, so know that using a fan is ok too. Just lay your Reishi mushrooms out on cardboard and point a large fan at them. It'll take longer, but they'll still dry.